Our awards ceremony this month covered the values from October, November, and December. 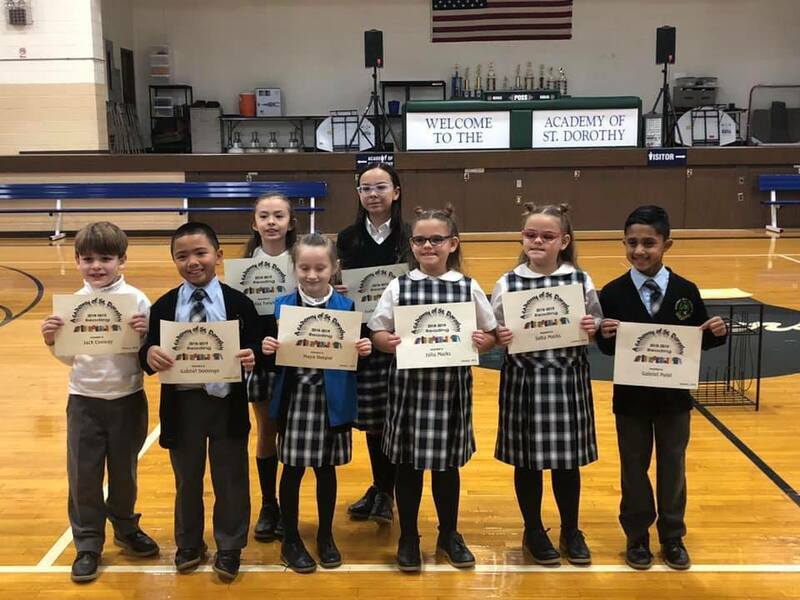 Congratulations to the recipients of the Respect, Obedient, and Patience Value awards. Respect: Alera, Sabrina, Jacob, Sal, Marc, Jack, Jack, and Elmie. Obedient: Lucas, Benjamin, Emirah, Julia, Adriana, Ava, JP, Samantha, and Naim. Patience: Juliet, Gabriel, Alexa, Bridgette, Ariel, Tiffany, Ava, Kyle, and Emma. In addition, we want to acknowledge those students who have already completed their 25 Book Goal for the year and earned a “no uniform today” card! Great job: Jack, Gabriel, Maya, Gabriel, Julia, Sofia, Sophia, and Isabella. God bless these well-deserving students and congratulations!